Today was our last day of “classes” – we had our last theory test today, and from now on, we’ll be shooting in the studio. 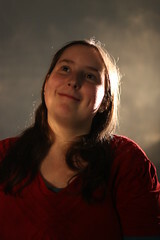 We kicked things off with a “free” studio session tonight after our test, and I set up for portraiture. 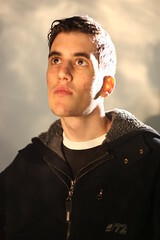 After a few pretty ordinary shots, my group started getting more creative with lighting. These were done by backlighting with a strong snoot, then reflecting the light back onto the subjects (and the white background behind them) using a flexible gold reflector with an irregular plastic surface – like a gold plastic sheet taped over a piece of cardboard. In the left image, the reflector was curved to focus the reflected light onto the subject; the light was kept more diffuse for the image on the right. The wide aperture served to blur the reflected light in the background rather nicely. ~ by Q on May 7, 2009.